Whether you're a first-time user or an experienced architect, Archigrafix Graphic Studio makes it easy to get started. Benefit from an intuitive interface that lets you be productive immediately. Quickly find colours for any project with the enhanced palette swatch from Archigrafix high-quality palettes, and eyedropper feature. Create a workspace that matches your workflow needs. 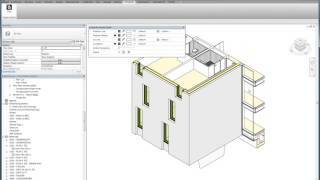 Take advantage of a tool that is always visible, can integrate in the Autodesk® Revit® Revit dock panel, can be used as an isolated window, inside and outside Revit and supports multi-monitors. Adjust all surface and line properties with minimum clicks, from 1 click away control. No need to click 6-7 times just to change one property. It works just like an illustration software. Work even faster with the expand selection tool that automatically selects similar objects, making it possible to change the colour of hundreds of objects with 1 click. Feel right at home with all of your favourite colour palettes! Explore and organize colours for your projects with the help of the colour swatch dialog that enables you to load open source palettes in GIMP format. Expand your collection of colours from vibrant and inspiring community Colour lovers.com that has more than 4,000,000 palettes ready for download in GIMP format. Take advantage of the multi-monitor eyedropper tool to pick any colour on your screen. Pick colours from a Revit document, a website, a photo or a drawing in PDF format. Graphic Studio is sold online as perpetual and subscription licenses. Please browse and buy, using a Secure Sockets Layer (SSL) on the software section of archigrafix webstore. Payment is processed via our partner Paypal: all major credit cards accepted. THis plugin has many very simple functions to edit graphics directly in the view. I especially like the eyedropper tool ( similar to what you find in the Adobe programs), and that you can edit line sizes in a very fast way. In addition the color palettes is very helpful, and gives much more options than the small Revit palette. Hard to work without it. I use this plugin often to match the graphic expression to existing drawings, or to make new illustrations with more freedom. Much quicker than setting materials or overrides. The eyedropper is a great addition.